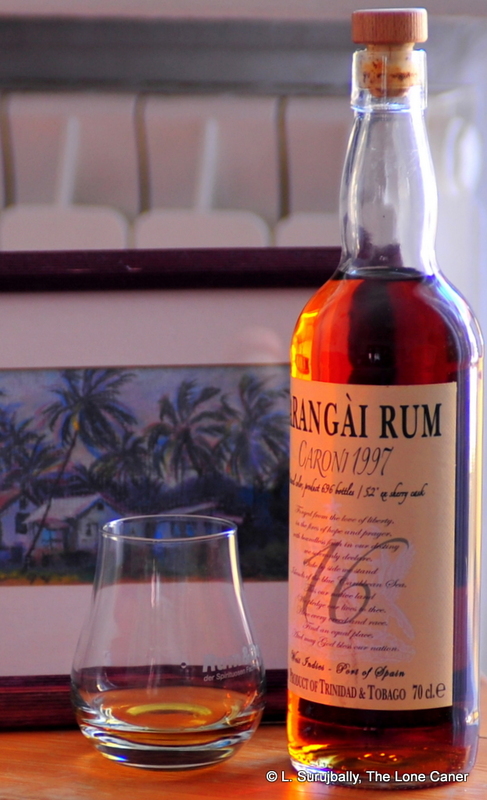 This is the second in a series of about six Caroni rums which I bought in mid-2014. It’s a solidly impressive rum, and quite a sophisticated, tasty bruiser. Barangài? What the hell is this? I asked myself, when scouring the online shoppes to come up with another Caroni perhaps worthy of purchase. I found out that the word is not a title or the maker’s name (as I had initially surmised) but refers to an old descriptor used by the islanders for ships of medium capacity: I suppose a caravel, or a carrack, or a ballinger would be as good a title. But never mind: it had a nice ring to it, a whiff of salt and seaspray and yohohos, and for that I gave in and bought it. On such small matters do the purchase of rums sometimes hang. Caroni’s older, pre-1990s stocks are the stuff of legend and tall tales: I often joke that you’re more likely to find a unicorn than one of those. However, in the past years, I noted that a number of bottlers are now issuing 1990s-era rums, so we may be entering into something of a golden age for this mothballed estate, where availability and price aren’t too far divergent (though they are still pricey, I hasten to add, since just about all are made by independent bottlers). Pellegrini SA, a craft bottler out of Italy about which I have heard nothing much before now (mea culpa, not theirs), sourced this 52% full proof from 1997 stocks – which, given the big fat “16” on the label, meant that it was bottled in 2013. They made a point of noting it had no additives, no filtration, and less than seven hundred bottles exist. Now, they also mentioned that it was aged and imported by them, but I was unable to find out how much of the ageing was done in situ, and how much in Europe – though I suspect at the very least, the final sherrywood cask finish was done in Italy. Sixteen years of ageing in two kinds of barrels certainly had its influence: the rum poured out in a dark-brown, almost-but-not-quite mahogany, and displayed the thick, slow legs of a sweaty steel band player banging away up Laventille Hill. The initial aromas were excellent, complex to a fault: cedar, oak, flowers, some fruitiness, orange peel, baking spices were right in the forefront, intense but not a liquid sword to the nose. In fact, for a 52% rum, I felt it to be impressively soft after the initial alcohol sting faded away – that sherry cask influence muting and smoothening things out, perhaps. I should also note that here was a rum rewarding some patience – it got better as it rested and opened up, showing off further musty and tarry scents, some smoke and leather, and I kept thinking of old-time sealing wax burning on paper. In its own special way it reminded me somewhat of the Bristol Spirits 1974 Caroni, though not quite at that level of quality. On the palate – heaven. Here’s a rum (one of many) displaying what I’ve liked about Caronis from the get go: it was medium bodied, both lightly sweet and briny, like crackers covered in honey, or toast and cream cheese: a liquid breakfast, if you will. Again, fruity sherry notes, citrus zest, flowers, hyacinth, licorice and hot black tar. And dry. It is actually (and surprisingly) more intense in the mouth than the nose would lead you to expect, a bit more spicy than those accustomed to rums bottled at standard strength might prefer – but by no means unpleasant, just something to watch out for. The fade was as good as the beginning, pleasantly long, a bit dry, with honey, corn flakes and some burnt notes of both tar and brown sugar. The “Barangài” moniker may have little to do with the rum, and may have been named for a medium sized ship, but I’ll tell you, title aside, the rum had the mad grace of a clipper with a full spread of sails, doing the transatlantic run in record time. I really enjoyed it. A few notes on the maker: the Italian company Pellegrini S.A. has been around since the very early 1900s (if not even before that), located close to Milan, and has been primarily known for wines, both as a distributor and a producer. However, as well as being a general spirits distributor, they do indulge in their own rum bottling, and their private stock has several of the Barangai Caronis, as well as Demerara, Jamaican and Bajan rums. In this sense they act much as Samaroli, Silver Seal, Fassbind, Velier and Rum Nation do – as independent bottlers who are so commonly found in Europe, but hardly so in North America (to that regions’s detriment). I’ve remarked before on how good the Caroni distillate is. If a slightly heavier, clear and tart mixing rum is your thing, this one might in fact work better for you than the somewhat more elemental Veliers, or even Bristol Spirits. Perhaps it’s something to do with the Italian sunshine, or its age. Still, with this particular Caroni rum and its sherry finish, I believe I can say with some justification, that it’s an excellent purchase, and won’t disappoint for the seventy five Euros or its equivalent that you would shell out to snag it.